Body digests food and turns it into calories, these calories are transferred through blood to each and every cell where these are converted into energy,this energy allows cells to perform their functions and regenerate. Body having slow digestion, higher toxicity or poor circulation of blood suffers with low energy and poor vitality. Numerous disorders affect this simple process of energy production and its supplementation in different ways. Digestive disorders can lower appetite and reduce food intake, toxins and other harmful agents can hinder digestion of food and reduce conversion into calories, poor defecation of waste matter causes slow digestion and lesser appetite both, and blockages in blood vessels or lesser RBCs in blood can reduce supply of energy to cells to cause poor vitality. Super Health capsules are reckoned as highly beneficial herbal energy capsules as these can handle all these issues simultaneously and effectively, and provide numerous other benefits to improve vitality, energy and stamina. Super Health capsules come loaded with herbs which possess innate properties to provide wonderful health benefits. Herbal ingredients of these Ayurvedic capsules for energy, stamina and power increase bile secretion by improving liver functions, bile metabolize fat to produce energy and also synthesize protein to grow muscle mass, improved liver functions also keep blood purified and free from toxins. Some of the herbs in these Ayurvedic stamina capsules improve enzymatic activities and digest food faster. These pills improve colon functions and ensure complete and regular defecation of waste matter. Ayurvedic capsules for energy, stamina and power balance secretion of health promoting hormones to boost-up metabolism. These supplement vital minerals like zinc which dilate blood vessels and improve flow of blood. Even blood flow supplies nutrients and energy to each and every cell and improve vitality. Higher blood flow also regenerate tissues at faster rate and strengthen muscles, organs and bones. These Ayurvedic capsules for energy, stamina and power protect tissues from free-radical damage and delay process of tissue ageing. These keep a person high on strength, stamina and energy naturally. 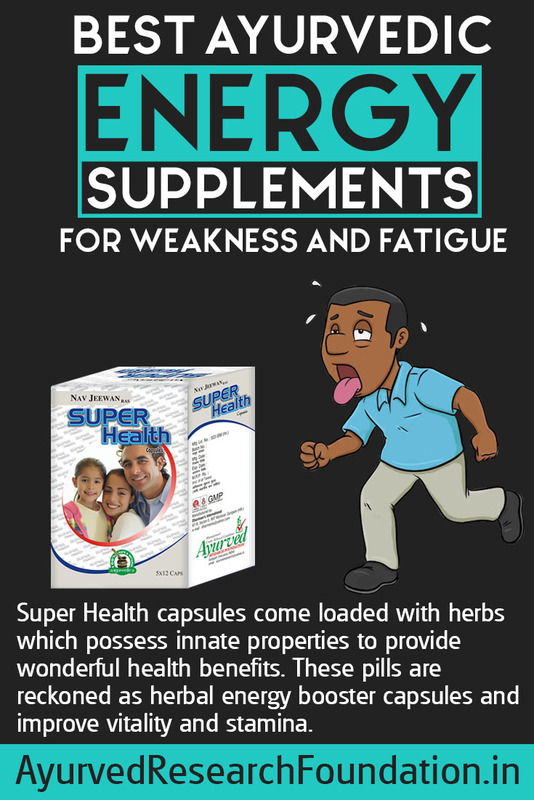 Super Health capsules possess herbs which improve nervous system and regulate healthy sleeping pattern and provide calm and relaxed mind. These also regulate healthy eating pattern and enhance nutritional intake to provide healthy weight and strong body. By lowering toxin presence and maintaining metabolism higher these grow lean muscle mass and boost-up immune system functions to keep body disease-free and healthy. 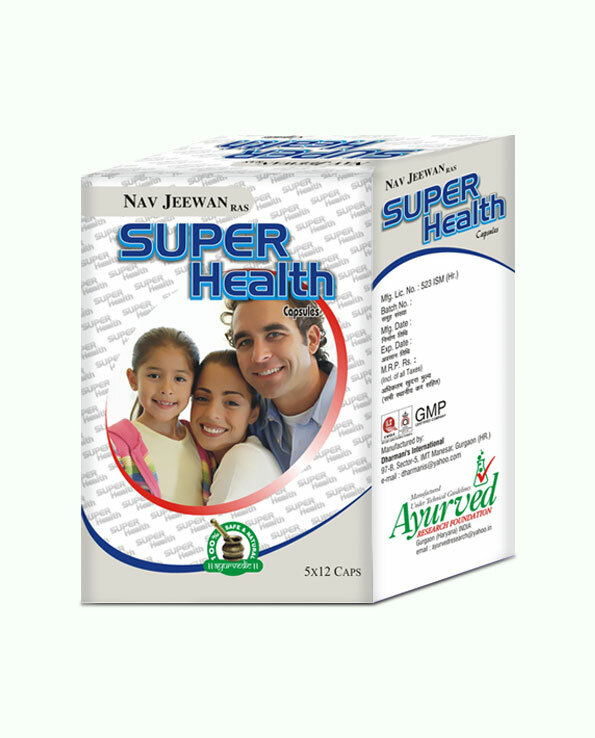 Super health capsules are made by using herbs which have impeccable reputation of providing marvellous health benefits. These herbs have been chosen after exhaustive research and clinical analysis so that their collective effects leave no cause of poor energy untouched and provide holistic treatment to the problem. The production process leaves no chances of contaminations and keep final product pure and safe. These are fit for regular and prolonged use and by person of any age. Thousands of people all around the world have used these supplements and have reported no side effect so far. These Ayurvedic stamina capsules possess herbs which are – Ras Sindoor, Sonth, Kuchala, Pipal, Kali Mirch and Lauh bhasma. Collective effects of these herbs make these pills fast-acting and dependable Ayurvedic capsules for energy, stamina and power. Ayurvedic supplements are designed so that people can gain amazing benefits of herbs with convenience. It is well known that using herbs is an expert’s job one needs to have complete knowledge of their properties, potency and dosage, but not with Super Health capsules. Experts have already worked out perfect dose and have selected right kind of herbs in correct combination after years of research to make these supplements easy to use. Consume one or two pills of these with water or milk after meals, once in morning and later at night. This is all you need to do to use these herbal energy capsules. How long do I need to take these capsules for good result? People expect overnight results from health supplements, it cannot happen, herbs need little time to work and eradicate problems and this cannot be done in few days. Though mentioning general timeline for all is not possible but as per user reviews it can be safely said that duration of 4 months shall be sufficient to gain maximum benefits. However this herbal supplement can be used for longer duration as well. Diet is extremely important and one should not ignore it even while using Ayurvedic capsules for energy, stamina and power. Consume healthy and nutritious diet comprising of wholegrain, legumes, beans and lentils and brown rice. Include green leafy vegetables, fat-free dairy products like yoghurt, milk, cheese, and snack on nuts and seeds between meals. Maintain healthy water intake and drink fruit juices. Avoid harmful foods which are deep fried, high in fat, processed or preserved. Avoid excessive tea and coffee and minimize alcohol or cut it out completely. We offer easy and safe payment methods for your convenience. You can send us a cheque or DD or you can wire us money through NEFT. We also offer facility to deposit cash in our account directly. Yes, in India we offer facility of COD as well. We deliver our orders through FedEx. We value your privacy and give it utmost importance. Your orders will be hand-delivered right at your doorstep in a discreet packing which will hide details and features of the product from outside. Generally our orders reach anywhere in India within 3 to 5 working days. I was suffering from low energy level since a long time. Then I came to know about Super Health capsules from the online reviews. It helped a lot in increasing my energy level. Highly satisfied!! It is one of the Best Dietary Supplements to improve stamina and also to maintain weight. Very happy with the product!! I had ordered these supplements for my mother as she was having the problem of fatigue and weakness. Now she has tremendous improvement in her health. Highly Recommended!! Great Product and highly recommended to improve strength and power. Works well as expected!! My daughter suffers from underweight problem and this product has helped her to put on weight and maintain it. Thank you, Super Health. I feel like the most effective alert person when I take this stuff. Untimely eating disturbed my hunger pattern. At proper timings I was always feeling full, I was eating much less and facing untimely hunger, due to all this my energy and digestive system started deteriorating. I was physically weak and dull and mentally frustrated and short-tempered. This supplement is truly amazing. It corrected my digestive problem, increased my hunger, brought back healthy eating pattern and gave me energized and stronger body. Now I am even regular at exercises and remain mentally calm and relaxed throughout the day. My experience with Super Health capsules pushes me to recommend it to all. This has even reversed the weakness inflicted by long term illness in a short span of time. I was ill for a pretty long period and even after recovery my body was overloaded with ill-effects of strong medication. Thanks to this supplement I am going full throttle now in a span of few months. These have eliminated whatever was harmful and hazardous inside and have rejuvenated my system completely. I am energetic and active and carry no signs of debilities. Wonderful!